The coming together of both Facebook and Skype began back in July, when the social network rolled Skype calling into its online chat system. All users needed to do was download a small applet, and then they could call each-other using Skype’s online telephony system, free of charge. Now Skype has reciprocated by bringing a touch of Facebook to its desktop apps, with new beta versions of is Windows and Mac apps being released today. 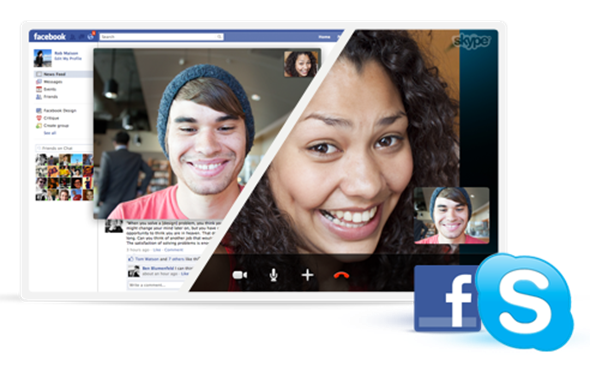 Skype version 5.4 for Mac and 5.7 for Windows will allow users to enter their Facebook credentials, bringing some of the social aspects of the website right into Skype’s own voice and video calling applications. Users of the beta, along with being public guinea pigs for both Skype and Facebook, will be able to see their friends’ status updates, instant message them and initiate video calls. This is all assuming it works as intended – remember folks, these things say beta for a reason! Interestingly, Skype does already offer its own built-in messaging service alongside its voice and video options. Whether Skype will eventually remove that feature in favor of using Facebook remains to be seen, but with 700 million-plus users, it’s fair to say that if you want to chat with someone, they’re probably on Facebook. This new development in the Skype-Facebook partnership is the latest example of how Skype is removing communication barriers and making it easier to connect with friends, family and business colleagues. Our approach to social is about personal connections with people. We are on a mission to connect over one billion people and our continued partnership with Facebook brings us one step closer to this goal. After playing with the app for ten minutes or so, there isn’t a great deal to report. Skype 5.4 on the Mac does feel less bloated and more responsive than previous versions, but that may just be the initial install warmth we’re feeling there, and it could well wear off after more use. The Facebook integration works relatively well, and all your friends’ updates are indeed front and center. We’d even go so far as to say we prefer Skype’s layout to the Facebook website, but we’re probably alone there.